When Holland America Line’s ms Koningsdam sets sail in April 2016, Captain Emiel de Vries will be in command. 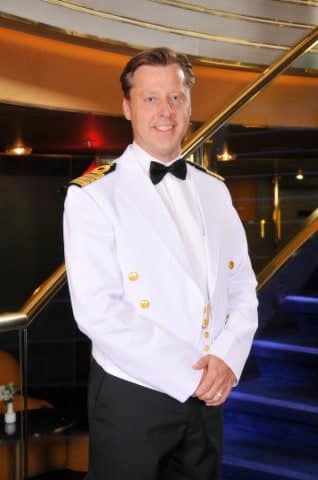 Having been with the company since 1997, de Vries rose through the ranks from fourth officer to captain and has been master of ms Amsterdam, ms Eurodam, ms Nieuw Amsterdam, ms Rotterdam and ms Zuiderdam. De Vries currently lives near Venice, Italy, to be close to the Fincantieri shipyard where ms Koningsdam is being built. He has been involved with the newbuild project since 2014 and participated in the functional design of the navigation bridge — his “office” when he is onboard. Hailing from the Netherlands, de Vries grew up just east of Amsterdam. He graduated from the Hogere Zeevaart School in Amsterdam, one of the oldest nautical schools in the world, with degrees in navigation and engineering. De Vries was introduced to Holland America Line in 1995 when he interned as a cadet on the former ms Noordam, and since joining the company, he has sailed on every class of Holland America Line’s ships.